As the UAE insurance industry was still coming to terms with a package of regulations contained in a recently-published UAE Insurance Authority circular, it has now been hit with a fresh blow, in the form of a just-published UAE Central Bank circular that also aims to take a hard line with those who market “savings and investment insurance/Takaful products”. 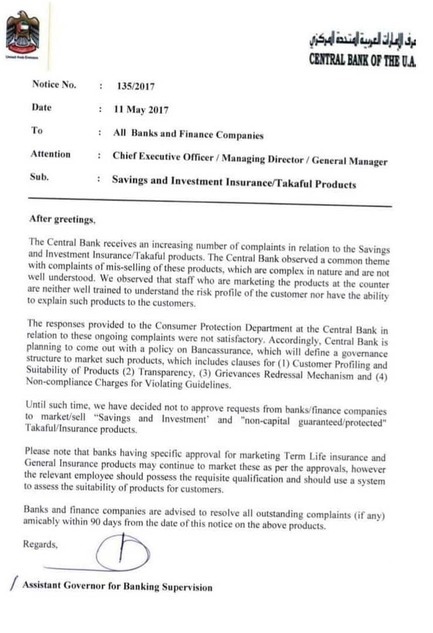 In a circular published on 11 May, the Central Bank declares that in response to “an increasing number of complaints” from consumers and “not satisfactory responses” from industry players, it is planning “to come out with a policy on Bancassurance [sales]”. And until this new regime is in place, the regulator says it has “decided not to approve requests from banks/finance companies to market/sell ‘savings and investment’ and ‘non-capital guaranteed/protected’ Takaful/insurance products”. It is thought the Central Bank is getting involved because it regulates banks, which are not covered by the UAE’s Insurance Authority, as are most advisers in the UAE who sell investment-linked insurance products. The banks typically sell insurance products that they receive from the major insurers, but which bear the banks’ branding, at least upfront. “Banks having specific approval for marketing term life insurance and general insurance products may continue to market these as per the approvals, however, the relevant employee should possess the requisite qualification and should use a system to assess the suitability of products for customers”, the circular continues. The Central Bank’s new Bancassurance sales policy, it says, which it is proposing to draw up over the next few months, will set out a governance structure to market insurance and Takaful products, “which [will include] clauses for customer profiling and suitability of products, transparency, grievance redressal mechanism[s], and non-compliance charges for violating guidelines”. It is signed by the assistant governor for banking supervision, whose name isn’t obvious on the document but who is Saeed Abdulla Al Hamiz. Some advisers were surprised to learn of the Central Bank action today, when International Investment contacted them for comment, even though the circular is a week old. Sam Instone, chief executive of the AES International advisory firm, said he had been aware that there had been talk of such an action, and added that it was “really great news for consumers, and another nail in the coffin of the traditional insurance product industry”. Nigel Sillitoe, chief executive of the Dubai-based Insight Discovery consultancy, a well-known provider of market intelligence, said the Central Bank’s circular would not be easy reading for some in the industry. 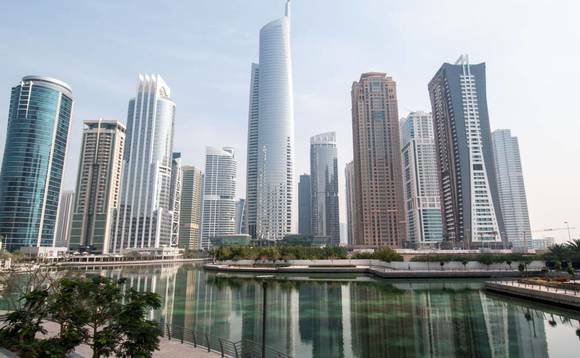 “The UAE ‘onshore’ regulatory environment has been shifting significantly over the last 12 months, and this is a demonstration that a further realignment is needed to protect the underlying consumer,” he added. “Whilst I’m not too surprised by some of the statements in this circular, it does further demonstrate that there is a drive for better consumer protection and higher standards for advisers operating within onshore financial services markets. “The circular appears to suggest that all banks need to rectify all the outstanding client complaints ‘amicably’ within ninety days. This could see an interesting outcome for the banks and the insurance companies, as the UAE central bank in the past has generally taken the position of ‘return the client to the monetary position he was in before he or she was mis-sold’. Sillitoe said that the Central Bank’s new approach – coming alongside various other regulatory changes being implemented by the UAE’s insurance authority and Emirates Securities & Commodities Authority as well as the full disclosure requirements being introduced for Isle of Man-based insurance product providers next year – meant that the next few years are certain to be “interesting” for those financial services companies operating onshore in the UAE. As reported, towards the end of last month the United Arab Emirates Insurance Authority quietly went public with a 26-page synopsis of its latest thoughts with respect to its already-flagged-up plans to introduce a raft of new regulations governing the way life insurance and insurance-based savings and investment products are to be marketed and sold in the country. About the news that the UAE Central Bank is now planning to join the Insurance Authority in cracking down on insurance product mis-selling, Robertson said the industry “only has itself to blame”. “Almost every day I hear complaints from someone who has one of these policies, and who considers the fees excessive. “The industry ignored all of this, and now they are being forced to give clients something they need at a price that is fair.